Panchayat leaders make decisions that can have a direct and immediate impact on villagers. Historically, national elections in India have had an average voter turnout of about 60 per cent, but there have been massive differences in turnout both across India and across different elections. 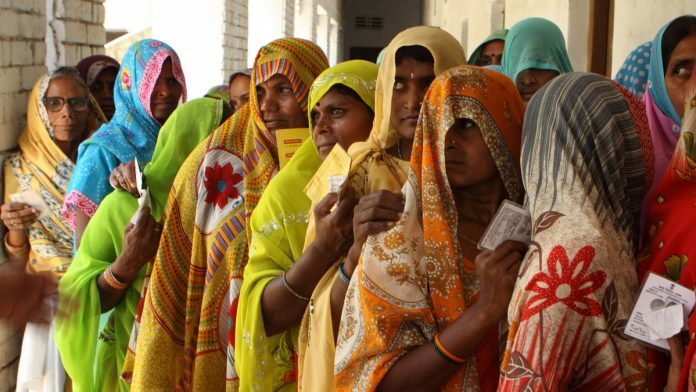 Voter turnout is important for the legitimacy of democratic elections, and Indian elections are known for their high turnout. It is also crucial in determining who wins an election because the party preferences of those who vote occasionally are probably different from the party preferences of those who vote each time. 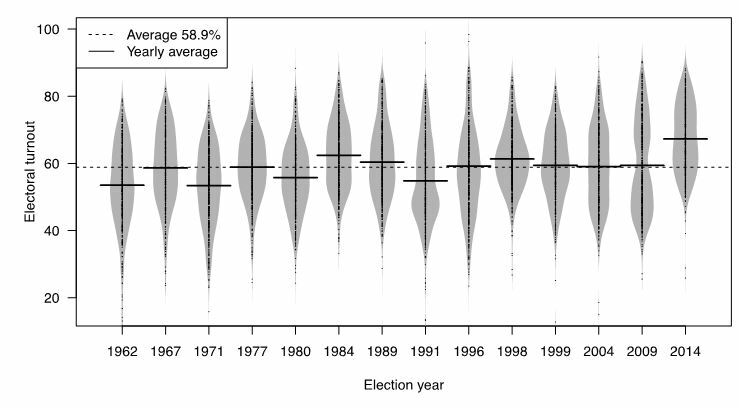 There is great variation in voter turnout in India across constituencies and over time. Our study shows that the size of the constituency also seems to have a large bearing on voter turnout. In Figure 1, we show a bean plot of the turnout across all parliamentary constituencies in each general election since 1962. The grey shape of the beans shows the distribution of values across the parliamentary constituencies for that election year; the small black dots following the middle axis of each bean show the value on the y-axis for individual parliamentary constituencies; and the horizontal line in the middle of each bean indicates the average turnout across all the parliamentary constituencies in that year. A quick look at the figure tells us that the turnout in 2014, which brought Prime Minister Narendra Modi and the BJP to power, was the highest in India’s history. of voting patterns in Indian elections”. Cambridge University Press. Chapter 2. A unique feature of the electoral turnout in Indian elections is that it is higher in local elections than in national elections. In countries as diverse as the United States, Finland, Canada and Germany, the turnout in national elections is always greater than it is for the local elections. The United States is an extreme example, where turnout in national elections is 30 percentage points more than the local elections (60 per cent to 30 per cent). In India, it is the other way around. While we do not have comprehensive data for panchayat elections all over India, individual studies of various states show that the turnout in local elections can top 90 per cent. A comprehensive study of panchayat elections in West Bengal, by Anustubh Agnihotri and Anirvan Chowdhury at UC Berkeley, finds that the average turnout in the 2013 panchayat elections was 85 per cent. Why do more Indian citizens turn out to vote in local and state elections than in national elections? Local elections are possibly important for three main reasons. The first is that personal and family networks are more salient in local elections. Residents of a village are embedded in a social network, and possible social injunctions associated with not voting help get voters to the polling booths. Migrants in Delhi we have spoken with make it a point to travel home for the panchayat elections because of the importance of the elections to their extended family in the village. Second, the local elite and panchayat leaders make decisions that can have a direct and immediate impact on villagers, and it is in the economic interest of the villagers to be politically engaged. Third, in a face-to-face society like a village, the local elite find it easier to mobilise voters and get almost everyone to vote. National elections are a different matter altogether. None of the conditions that hold for local elections and panchayat leaders apply to national elections and Members of Parliament (MPs). MPs often do not make decisions that have an immediate impact on a villager’s economic well-being; the local elite are unable to mobilise every single voter because parliamentary constituencies have, on average, over 15 lakh eligible voters, making it almost impossible to do so. As a result, there is less social pressure from family and friends to turn out to vote. There is also less pressure to vote for the same person as the rest of the community. Voters are often unaware of who represents them in Parliament. A Lokniti/CSDS tracker poll conducted in July 2013 asked respondents to name their MP, and only 57 per cent of them could do so. If social pressures and local connections are important for turnout, larger constituencies should have lower turnout. In Figure 2, we look at how the size of a constituency (or rather, the number of eligible voters) is associated with the turnout in the 2014 Lok Sabha elections. In the plot, each dot represents one parliamentary constituency. The trend line going through the plot shows quite clearly that the larger constituencies have a much lower turnout. There could be many reasons for why voter turnout in constituencies varies as the population increases, such as higher poverty level or that more people have migrated far from where they are registered to vote. 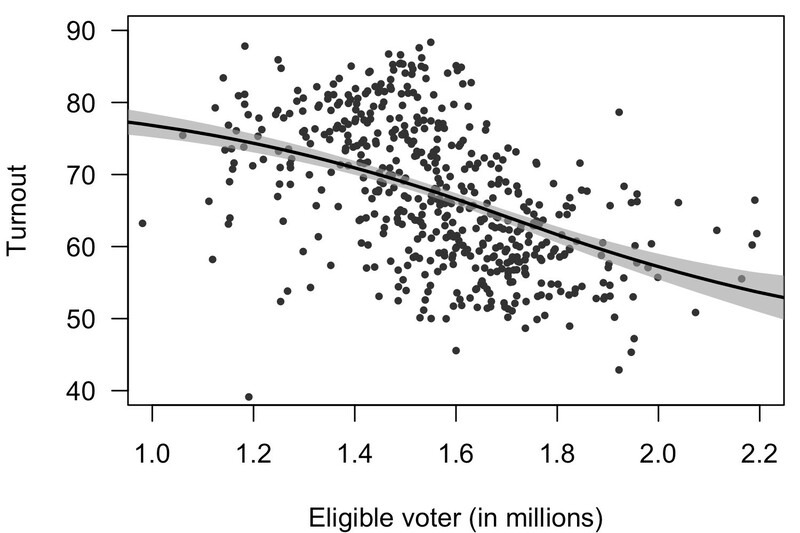 However, size of a constituency may also in itself have an influence on turnout. In more populous constituencies, there is a very large number of people that parties and candidates need to reach out to. This is logistically challenging. More people mean more interests to represent, making it difficult for politicians to tailor their political message in a way that seems meaningful to all their potential voters. This even seems to be true for gram panchayat elections. In Figure 3, we show the turnout for gram panchayat elections held in 2015 in Banda district of Uttar Pradesh. 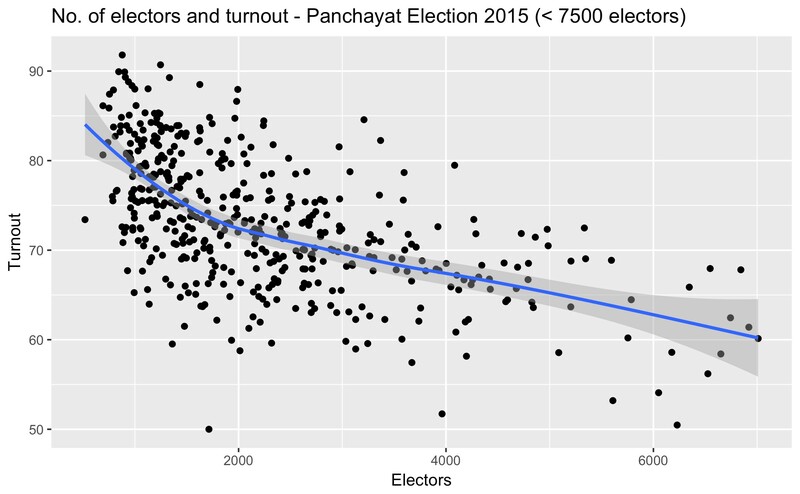 Here too, we see that as the size of the gram panchayat increases, the turnout drops. Figure 3: Size of the Gram Panchayat and turnout in local elections in Banda District (Uttar Pradesh), 2015. These findings suggest that political participation is likely to be higher when politicians are more directly connected to voters. These connections are currently more prevalent in local than in national elections.